‘‘You’re in luck, sir”, chirped Shane Delgado, the PR specialist of Legado Motors, Inc, Philippine distributor of GAC Motor. The vehicle that Shane was referring to is the 2019 GAC Motor GS8 sport utility vehicle (SUV). Mind you, the external dimensions of the GS8 may be that of a mid-sized SUV but the interior accommodations rival those of a full-size SUV. There are three rows of luxurious white leather seats to comfortably accommodate seven discerning occupants but the second row seats can slide back and provide a generous amount of legroom. As we said, it’s an SUV fit for royalty. Speaking of royalty, the Queen of England gets driven around in a Range Rover and the First Lady of the States gets driven in a Cadillac Escalade. Thus, it makes sense that the Queen of the Universe gets driven around in something that possesses similar regal traits. To that end, the GS8 does not disappoint. When we first saw it at its launch, we thought that it was as imposing as a top-of-the-line Toyota Land Cruiser V8 or its Lexus equivalent. Finished in deep glossy Piano Black and contrasted by tasteful chrome bits, the GS8 looks as elegant and as expensive as any Japanese, European and American luxury SUV. The composite LED headlamps are a thing of beauty and purpose. They draw your eyes towards the imposing grille and the strong muscular front flanks. The headlamps and grille looks integrated, classic yet modern at the same time while the daytime running lights (DRLs) mimic the shape of the grille corners. Viewed from the side, the GS8 seems to stretch its body over the wheelbase to meet the conservatively-finished rear design, which was purposely upright and boxy to provide valuable headroom for the second- and third-row passengers. However, the rear lift gate is power actuated so its upright design is well justified. Overall, it’s fit for a queen to be seen being driven around in. While the queen is enjoying the drive from the comfort of her backseat, the chauffeur (driver) and the body guard (front seat passenger) are likewise treated to the same luxury and opulence. The driver sits in a comfortable and ergonomic leather seat that is 8-way power adjustable with three memory settings. The driver’s seat automatically moves back when the engine is turned off and the driver’s door is opened to assist ingress and egress. A leather-wrapped four-spoke steering wheel, which turns an electric power steering (EPS) system, features multi-function remote controls for the infotainment system, mobile phone connectivity, cruise control, and digital instrument panel. The GS8 features an Electronic Parking Brake (EPB) system, which has an “Auto Hold” feature that offers additional braking security when the vehicle is in motion, especially during uphill and downhill driving. It augments the safety features of the electronic Hill Start and Hill Descent controls, which aids the driver handle and navigate the GS8 on a steep incline. Of course, the now-standard anti-lock braking system (ABS), electronic brake distribution (EBD), myriad number of airbags, and other passive and active safety systems ensure that the queen and, ahem, the other occupants of the vehicle, are always safe. There’s also the 3-zone electronic climate control system, which allows the driver, front passenger and backseat occupants to tailor-fit the temperature to their desired settings. A vastly entertaining infotainment system does exactly what it is designed to do: entertain the occupants of this luxury SUV. Meanwhile hidden and open cubby holes allow the occupants to store their drinks and valuables. Sadly, there’s no special place for the Queen’s scepter and crown. And speaking of entertainment, the GS8 has a neat party trick: With the transponder key in your pocket, the SUV unlocks its doors, unfolds its side mirrors, and gently sounds its horn as you approach it. And when you alight, it automatically locks the doors, fold the mirrors, and sounds off with a gentle toot as you walk away. No need to fiddle with any button. As we mentioned in our write-up about the GA8 premium luxury sedan, Chinese automobiles are now almost in the same league as their Japanese, American or European counterparts. The GS8 is quite comparable to the Audi Q7, Lexus RX450, and to an extent, the Cadillac Escalade, minus the size, of course. Luxury features like rear overhead aircon vents, longer rear doors, ISOFix child safety anchors and side curtain airbags are no longer exclusive to the luxury brands. If only the Chinese manufacturer can do something about their “GAC Motors/Trumpchi” brand confusion, then the GS8 can be mentioned in the same breath as its exclusive luxury SUV contemporaries. But, truth be told, the GS8 is really fit to ferry a queen. It looks regal enough, it accelerates powerfully away, it drives comfortably and surefooted, and it pampers its occupants opulently. We appreciate its two-way power sunroof with jam protection, its expansive sky roof, its Smart Key and Start/Stop button, its one-touch power windows with jam-protection, its interior light time delay and automatic turn-off function, and those neat courtesy light that projects the stylized “G”logo on the ground to illuminate the area near the car’s front doors. It provides some form of entertainment when people try to guess where the light comes from. It is also a great conversation starter. Courtesy lights project a “G” logo on the ground nearest the doors. Since we don’t have a close-up shot of Catriona with the GS8, we asked our regal cat, Coco, to grace the backseat. 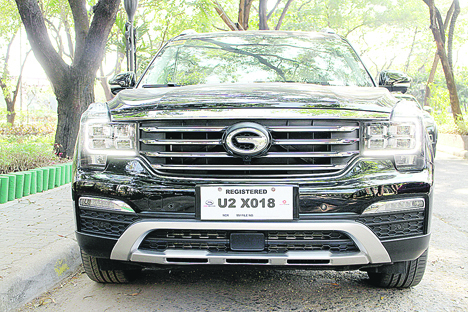 While our 2019 GAC Motor GS8 GL i4WD may not have all people gawking at it immediately, it already transported a reigning queen, Miss Universe 2018 Catriona Gray, who’s someone to really gawk at, and it was driven by a chauffeur aptly named “James”, who must have done all the gawking. And once again, for the record: No, it is pronounced as “G.A.C.” not “gak”. It’s like B.M.W. or G.M.C. except that this car company has a vowel between two consonants. And yes, this car company is from China. But the quality is world-class and the appeal is more than global. It’s now universal, as in Miss Universe.